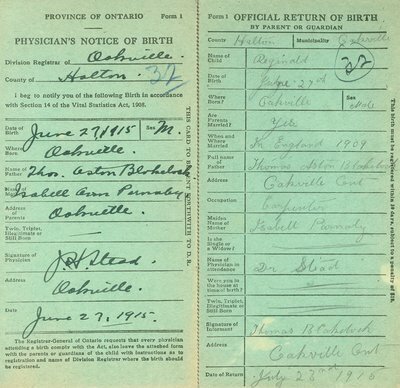 Physician's Notice and Return of Birth for Reginald Blakelock, son of Thomas Aston Blakelock and Isabell Blakelock (nee Parnaby). Reginald's father was T.A. Blakelock, a prominent Oakville resident and carpenter who served as mayor for a period of time. T.A. Blakelock High School on Rebecca St is named after him.